Due to extensive damage from flooding as a result of a waterline break, the Boscobel Public Library will be closed until Monday, August 3rd. Books and other items may be returned to the blue, outdoor book drop at the library's rear entrance. The library will not be able to checkout any items or handle other requests until regular hours resume on Monday. Patrons who need to renew items already checked out can do so online by going to this link: online library catalog. Click on "Boscobel" and sign into your account with the 14 digit number on the back of your library card. Or call the library and leave a phone message requesting renewal. Please include your name and phone number. We are hoping to resume all other library services and programs by 8/3 and appreciate your patience while we are cleaning up. Additional information, updates and photos for the curious will be posted to this blog, as well as at the library entrances. shucks! that looks awful. sorry you guys have to deal with that. good luck with the clean up. Wow! After all the work that has been done to update and improve now this! We spend so much time there it feels almost like my living room was flooded. August, to help with moving books and shelves upstairs. 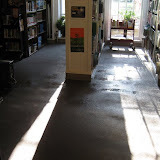 The flooring that got soaked in the main library is going to be replaced but first we have to move everything off of it. This will be our biggest volunteer effort this year, so if you have the time we'd love to have your help! Thanks!